Like many databases, Cassandra uses rolenames and passwords for internal authentication. Role-based authentication encompasses both users and roles to bring a number of useful features to authorization. Roles can represent either actual individual users or roles that those users have in administering and accessing the Cassandra cluster. An individual user can be granted any number of roles, just as any functional role can be granted another role's permissions. 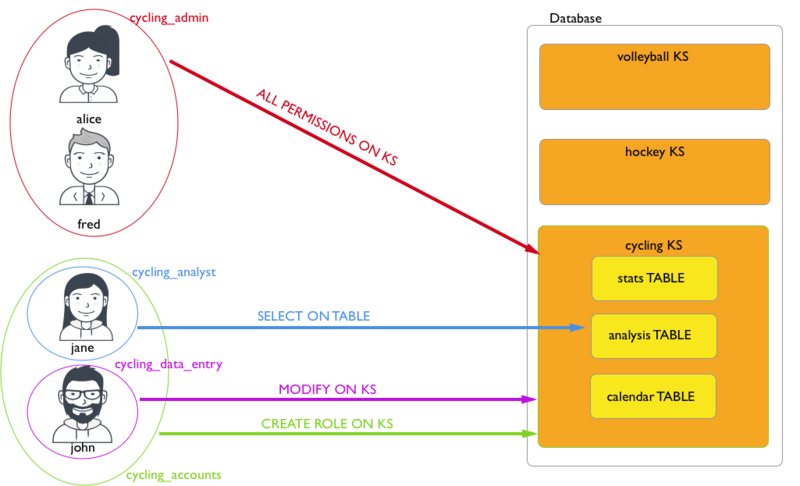 In this example, the role cycling_analyst has the ability to select data, and then gains the ability to select data in the another table hockey when the role hockey_analyst is granted. If a user then is granted the role of cycling_analyst role, that user will be able to select data in the additional table hockey The illustration above would be modified to show that the user jane now has access to two tables. Cassandra is configured with a default superuser role and password pair of cassandra/cassandra by default. Using this role, additional roles can be created using CQL commands. To secure the system, this default role should be deleted once a non-default superuser has been created. Once roles and passwords have been set, Cassandra can be configured to use authentication in the cassandra.yaml file. If roles exist and Cassandra is configured to use authentication, Cassandra tools must be executed with optional authentication options. DataStax drivers - produced and certified by DataStax to work with Cassandra.